Q: I heard that you created a way to build to allow a larger opening. Please explain. A: I did devise a way of interlacing pairs of bags over an arch form to span 6 feet, which enabled me to create some large openings for passive solar gain. Q: Can you tell me more about this interlacing of bags to increase the possibility of a larger opening? A: Yes, the basic pattern is like this photo, where two bags are placed side by side, and then the next course of two bags goes at right angles to the first, then the courses alternate orientation as they are stacked. This pattern can create more stable columns than single bags, and they can be stacked over arch forms to make the arches. It is not necessary to angle the bags over the arch; just place them horizontally and corbel the bags to create the arch. In order to get the bags to fit this way I had to fill them very full and staple or hem the bags so that each bag was twice its width. 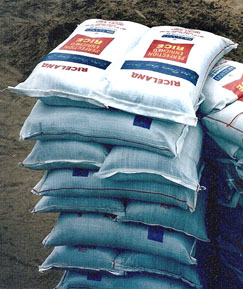 Q: Pictures of earthbag arches give the impression the bags are nice and uniform from front to back. But actually they are tapering to create a dome, correct? If I bevel everything to fit the natural shape of the dome, I should be OK, right? A: With most of the earthbag arches that I made at my house, I placed the sewn bags the long way over the arch form, so that they were quite a bit thicker than the wall in general. This way the arch was formed vertical and the dome wall traveled along the length of the arch depending on where it needed to go to keep the dome shape flowing. I do remember that on one occasion, with the 6' arch in the bedroom, that I did have to angle the arch bags inward somewhat to allow the dome shape to continue, and this worked out just fine. Q: I saw that there were precast concrete arches built, and then put atop, or adjacent to, filled sandbags to speed up the process. I couldn't tell if sandbags were then stacked over the precast arch or not. A: I haven't seen this having been done, but it should work, although it would be pretty heavy if you wanted to remove it to use over again. C: I've been thinking about solar domes made with earthbags, but you need a certain amount of earthbags to maintain wall integrity. Now I'm contemplating using a series of vaults made with round pipe to create window walls in domes. They would have to have strong concrete footings and be fabricated in a shop. I'm estimating 3"-4" pipe covered with sheets of metal. They could be pre-built, and then the vaults welded together once set in place. This is an added expense, but it adds solar gain. It also makes domes more interesting. R: I made a rather effective earthbag solar dome in both the living room and bedroom in Colorado. Both of the glass doors spanned 6 feet, and provided a lot of solar gain, which along with the large circular windows was just about right for that climate. Those arches were made by using double bags in a cross-hatch pattern...and were very strong, even before being braced with other bags on their sides. The form could have been remove immediately and the arch would have stood. Your pipe idea would probably also work...but may not be necessary. Q: My coworkers and I have made a slight change to our building plan as far as the doorway/hallway is concerned. Originally we were going to build a square insert for our hallway then lay a header for support then earthbags on top of that. Now we have decided to create an arch hallway instead. So my question for you is this... when determining the angle of the arch for the hallway, is it better to have a steep or shallow arch? If I have a 7' door, do I start my arch at 7', or can I start it lower? A: Steeper arches are slightly more stable perhaps, but even half-circle arches are usually fine in openings no wider than about 3 feet. For wider spans, a steeper, more Gothic arch is probably better. Even with a half-circular arch, the first few inches are nearly vertical, so theoretically the arch could be started a bit lower than the height of the door, but I think aesthetically it looks better to start the spring-line of the arch right at the top of the door frame. Q: I was wondering, after reading your account of constructing an earthbag arch, how wide you might make one while retaining stability? 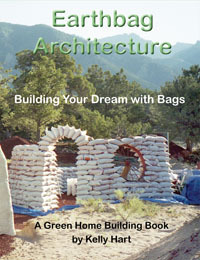 The reason I ask is that my husband and I have been considering earthbag building as an option, down the road. Since we are mainly attracted to the lack of lumber involved, attaching a separate roof would defeat this purpose (and add a great deal of expense.) The sticking point that keeps coming up is the construction of a garage, which seems necessary, given the local environment. Would it be possible to safely construct an arched entrance in an earthbag dome wide enough for a car to pass through? A: The widest arch span that I have done is 6 ft., and I wouldn't recommend going any wider than this. It might be best to design an earthbag garage with an engineered truss of some sort.